This blog post by Samantha Buzzard, a NERC student at the University of Reading, is part of a series on Responding to Environmental Change, an event organised by the Natural Environment Research Council (NERC) funded Doctoral Training Partnerships at Imperial (SSCP), and the University of Reading and the University of Surrey (SCENARIO). To conclude the Responding to Environmental Change meeting Matthew Bell, Chief Executive of the Committee on Climate Change, outlined the position of the UK in relation to climate change and the issues that could be faced at the Paris Climate Conference (COP 21) at the end of this year. At the beginning of his talk he emphasised that the credibility of the Committee on Climate Change depends on properly interpreting the science of climate change and also that the committee should feedback into the scientific community through signalling the gaps in the evidence and determining what research would be most valuable in the long term. Matthew made it clear that most of the debate in the UK was not whether climate change is happening, but around the uncertainty of the levels of change and its impacts. This was highlighted only a few days ago when David Cameron, Nick Clegg and Ed Milliband made a pre-election pledge to uphold the climate change act, which holds the UK to a statutory 2050 target for emissions reductions. In fact when the act was first introduced in 2008 it received massive cross-party support with only three MPs voting against it. It is because of this act that Matthew was able to speak to us – it established the Committee on Climate Change as an independent advisor to report back to the government annually on the UK’s progress towards meeting the five year legally binding carbon budgets that the country has been set in order to meet the 2050 emissions target (the Committee also suggest the levels that these five year targets should be set at when they are planned). The Committee also gives an assessment of the country’s adaptation to climate change, ensuring that actions taken are in line with the level of risk expected. The UK’s 5 year carbon budgets. The UK met the first budget but mostly due to the economic slowdown. (Source Matthew Bell, Committee on Climate Change). There will be many areas under discussion at COP 21, ranging from pledges and the monitoring of them once they are made, support from high to low income countries (both financial and non) and the actions required from ‘international’ sectors such as aviation and shipping. Some work has been done to calculate the net impact of tackling climate change but the error bars are large and more work is needed. The current recommendation that the Committee on Climate Change are suggesting would costs less than 1% of the UK’s GDP. The UK is currently in a good position leading up to COP21 having met the first of our five yearly carbon budgets – although it must be stressed that this is largely due to the financial crisis and economic slowdown rather than specific policies. There is still a lot to do to meet the 2nd and 3rd targets and the 4th is going to be a very big step down. 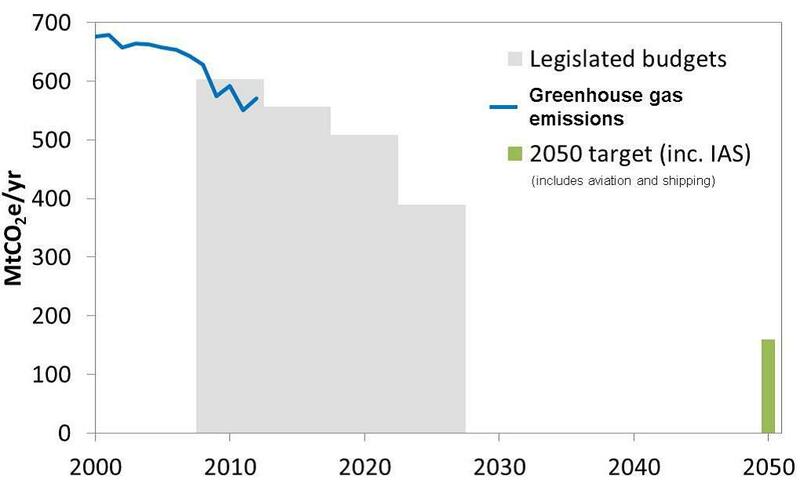 A key stage in reaching these targets will be to have a largely decarbonised power sector by 2030. Matthew suggests a highlight for future research could be the wider use of low-carbon heat, for example having this in 15% of homes by 2030. To ensure the success of policies relating to these changes more research also needs to be done into behaviours – what prevents people taking up green actions and determines their reactions to environmental policies? It was emphasised that we also have a poor evidence base and lack of data for working with the industry and agriculture sectors, so these areas need greater attention in future. Furthermore, despite success in reducing vehicle emissions by a greater amount than expected (due to EU regulation) it will now be even more challenging to reduce them further. The Committee are due to release a progress report on both adaptation and mitigation in June outlining the key risks to achieving the 2050 carbon target and will also advise on the level of the 5th carbon budget (the 2028-32 budget as these are set 12 years in advance) at the same time COP 21 is taking place in December. Help in different areas will be important to the Committee this year and well beyond. From scientists better near-term climate models, better monitoring and understanding of the full life-cycle of greenhouse gas emissions and their wider environmental impacts and linking the science of diversity, ecology and evolution to policy debates about climate will all be helpful for the committee’s work. However, this will need to be combined with better understanding of people’s behaviours and gaining the optimal balance between adaptation and mitigation, as well as understanding the best timing and level (local, regional or national) at which to apply measures.